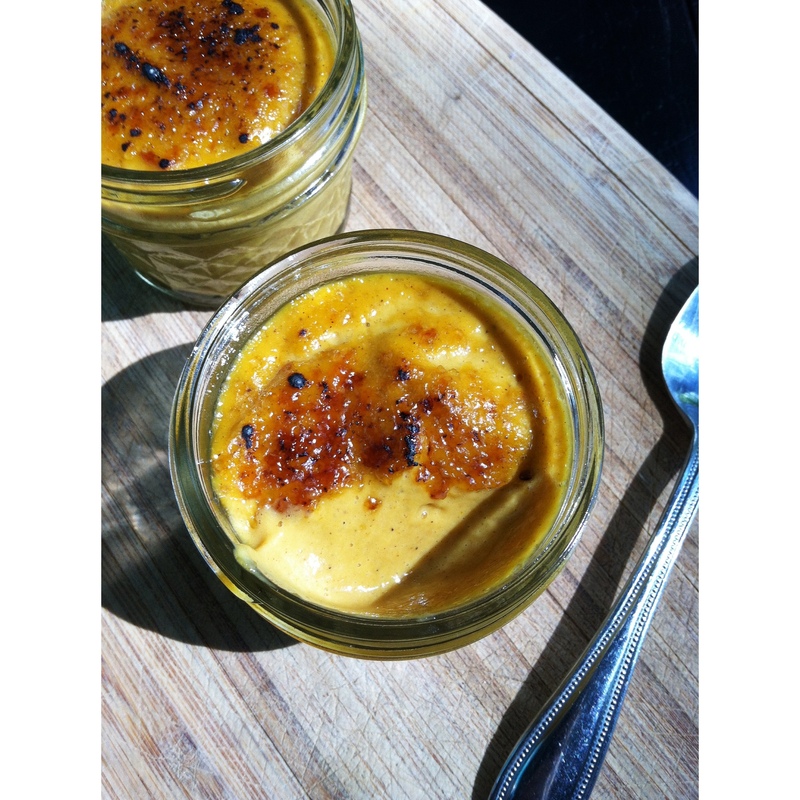 Pumpkin Custard Brûlée. | Eat More Plants. If you love pumpkin pie, this custard is a must. I’ve been making this seasonally for years and with the addition of raw cashews, agar powder and using my vitamix, it’s taken to a new level. It is a big help to soak your cashews in warm water (4-6 hours is sufficient) if you don’t have the best of blenders and it will still come out fine. Blend everything until creamy, stopping to scrape down the sides if necessary. In the vitamix, if blending on high, it will begin to heat up (quickly!). I wouldn’t blend in there for more than a minute. Personally, I don’t have the patience to cook this or even let it set up in the fridge. I eat it as is! If you want to cook it to get more of a baked custard type dish, preheat your oven to 375. Place ramekins on a baking dish and fill with hot water so that the water is halfway up the sides of the ramekins. Be careful not to get water into the dishes. Fill each ramekin with custard. You’ll be able to fill 5 completely or 6 almost to the top. Bake for 30 minutes and check for doneness. I don’t think you should need to bake for more than 35 minutes. Be careful not to hold the torch too close to your custard because it will burn. Wave it back and forth (a few inches above) slowly over the top until it’s brown and bubbly. Note: even though I usually don’t bake these custards, I still brûlée them. It’s an added crispy bonus. I love creme brulees and this looks really good. And as we’re under a frost warning tonight (way too soon!) this works. “Wacky pregnancy cravings…” You know, sometimes you have to go with the flow. I saw that and thought, hmmm. something like that should go on the development calendar. Cheers!